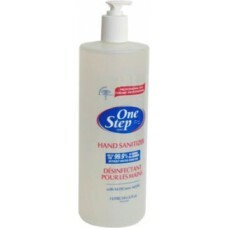 One Step(TM) hand sanitizer original. Kills 99.9% of most common disease-causing germs in seconds. Contains moisturizing aloe. Active ingredient: benzalkonium chloride 0.15% w/w. Contains 62% ethyl alcohol. Hypoallergenic. 1 L.
The hand sanitizer used in many hospitals across Canada Perfect for home or office use. Directions: Use whenever soap and water are not available and to supplement routine hand washing. Apply liberally to hands and rub thoroughly until dry. Children under 6 years of age should be supervised when using this product. Other Ingredients: Water, Isopropyl Alcohol, Emollient, Thickeners, Aloe Barbadensis Extract, Fragrance. Apply to clean dry hands. Wet hands thoroughly with product and allow to dry.